Paneer, for the ill informed (I include myself) is an Indian cheese, which is simple to make, or so I’m told, so simple in fact that almost nobody sells it, and I mean NOBODY! Twitter was a flutter with helpful suggestions and recipes, setting me on my way, I even got as far as to sourcing a cotton Indian weave dish cloth to strain/drain the would be cheese. Muslin being preferable, but my wife was loathed to let me use my son’s Mothercare ones in the interest of experimenting. It was then, and only then I read Michael Oliver’s recipe, which suggested hanging the results in the fridge for 24-48 hours, WHAT! I don’t have that much time to wait! I can barely make it through a 20 minute meal. Enter Lady Raven of ‘Add to Taste’ fame, who told me about Maharajah, a vegetarian Indian restaurant situated in Rondebosch. I immediately bundled the family into the car and we headed over. We were greeted by chef/owner, Theresa. I explained what I was doing by cooking my way through these recipes, the blog and my dire need for some assistance with the Paneer, and yes, she to told me how easy it is to make, though she emphasised with my dilemma and was most helpful in providing me with some, and while she doesn’t make a habit of it, it is nice to know from one cook to another that there are still helpful people in this world. We decided to buy a few samoosas for the road and can highly recommend the potato and coriander ones, though the spinach and ricotta also sound/look delicious. We need to head back there for a sit down meal to enjoy more of her offerings, but I had a date with destiny, errr, Paneer! So thanks again to Theresa for her help, pop in and try her wonderful cuisine. You can find them at 6 Rondebosch Court, Fountain Square, Rondebosch, Cape Town and you can call them on 021-6857891. Right, back to the meal, having missed our ‘Meat-free day’ on Tuesday we had to make up for it with this dish. 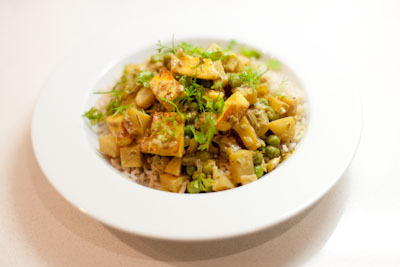 It is simple to prepare (once you have all the ingredients), the curry base made up of garlic, ginger, cumin seeds, ground tumeric and garam masala, fried together with some red onion, which, when ready, one adds in the fried paneer, peas and potato. This is all served on a bed of cardamon infused rice and garnished with fresh coriander (home grown of course!). It is certainly tasty and one of the nicest vegetarian dishes in my challenge, not at all spicy, yet filled with exotic flavours and textures. Highly recommended. I know, I know! I still have plans to make it, I just needed it sooner, rather than later to complete my challenge. Thanks for the well wishes for the week ahead, right back at you! Tesco and Morrisons sell Paneer in Scotland! Thanks for stopping by! Ironically you are more likely to get alot of these ingredients in the UK than here in South Africa, but great to see chain supermarkets stocking these specialty items. Hi Matt. Just wanted to add, I make paneer every time my milk has gone vrot…it’s an excellent way of using up old milk. But I don’t find it needs hanging at all..I just squeeze the curds in the muslin cloth and bung it in the fridge with a plate on for a couple of hours..simple! Thanks for the input! It’s been sometime since I last had Panner, infact probably the date of publishing this recipe, I need to get back to it!